Lange Challenger Model Plectrum Banjo, c. 1930, made in New York City, serial # 359, natural varnish finish, laminated maple and mahogany rim, laminated mahogany neck with rosewood fingerboard, original black hard shell case. 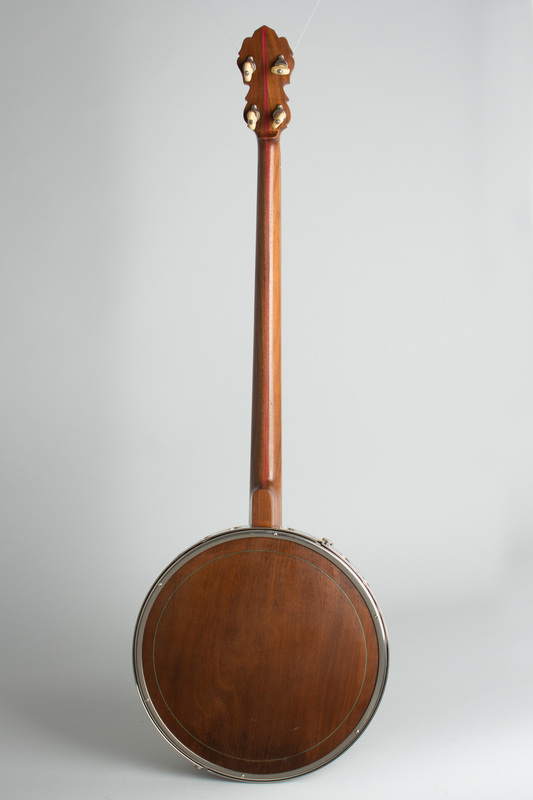 William Lange really loved banjos. He basically invented the modern resonator-and-flange banjo in 1921 with his Paramount line, and kept on working on new ideas for years afterwards. This "Challenger" model is one of them, a sub-Paramount but still pro-grade instrument from the later 1920's. The salient feature is the heavy metal flange unit, which is built in two interlocking pieces. A quick lateral push on a convenient knob opens or closes large holes all along the resonator side rim, which makes the banjo a bit louder-at least to the person playing it! Other features include a simple archtop tone ring, unbranded Paramount style tailpiece, "hotdog" armrest, hoop and hooks, small-housing Page tuners and some attractive shaped pearl inlay. As with Paramounts there are multiple wood laminations and bindings in the appropriate places. 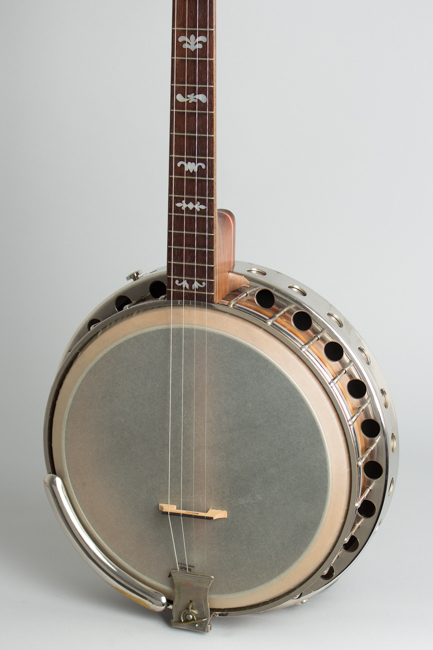 This is one of those banjo oddballs that never really caught on but is an excellent instrument either because of, or in spite of despite the unconventional open-and-close resonator feature-depending on how the idea strikes you. 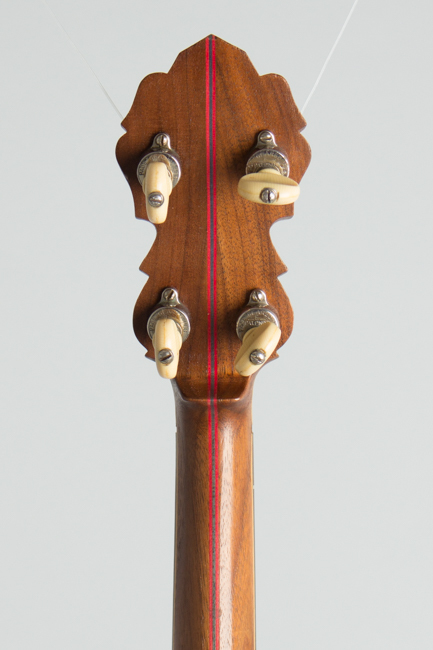 Overall length is 37 3/4 in. (95.9 cm. ), 11 1/8 in. (28.3 cm.) 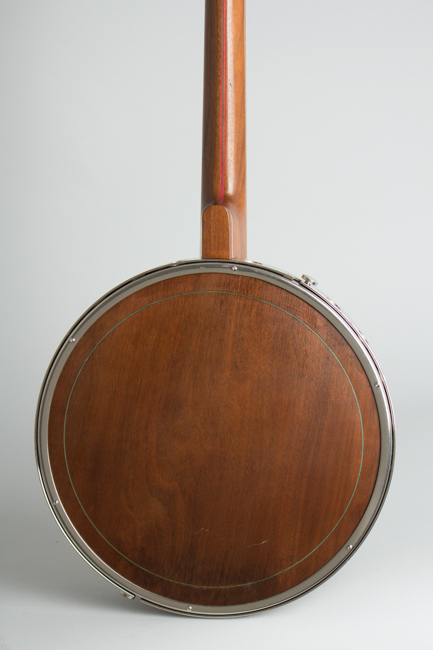 diameter head, and 3 3/8 in. (8.6 cm.) in depth, measured at side of rim. Scale length is 27 in. (686 mm.). Width of nut is 1 1/8 in. (29 mm.). This banjo has been refinished in a more satin varnish than the original Lange style, but retains all of its original parts and plating. There is some minor wear overall. 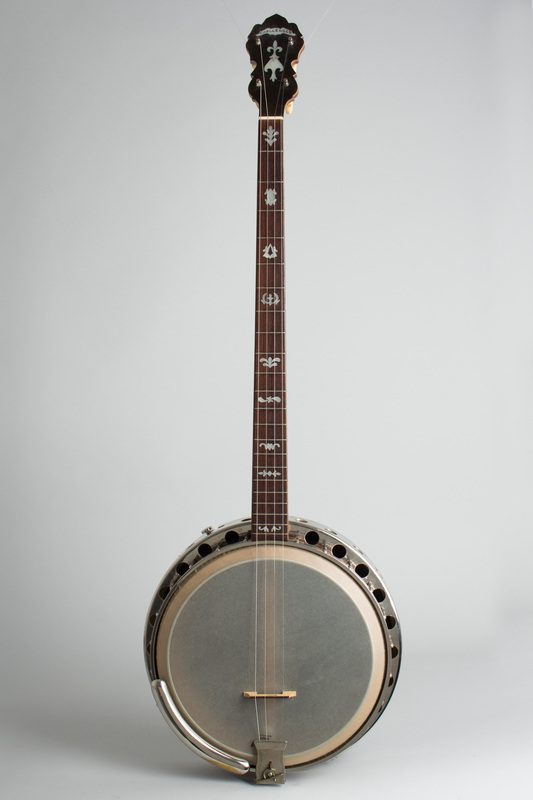 The fingerboard has a slight rise at the body end but the banjo is quite playable. 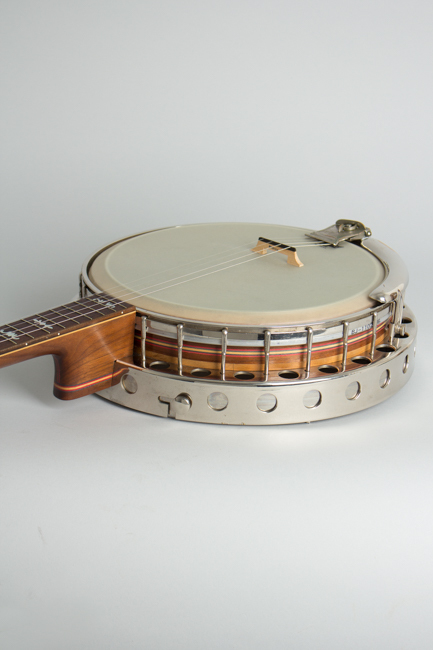 This is a nice find in a student grade or general knock-around plectrum banjo, which is something we rarely see. 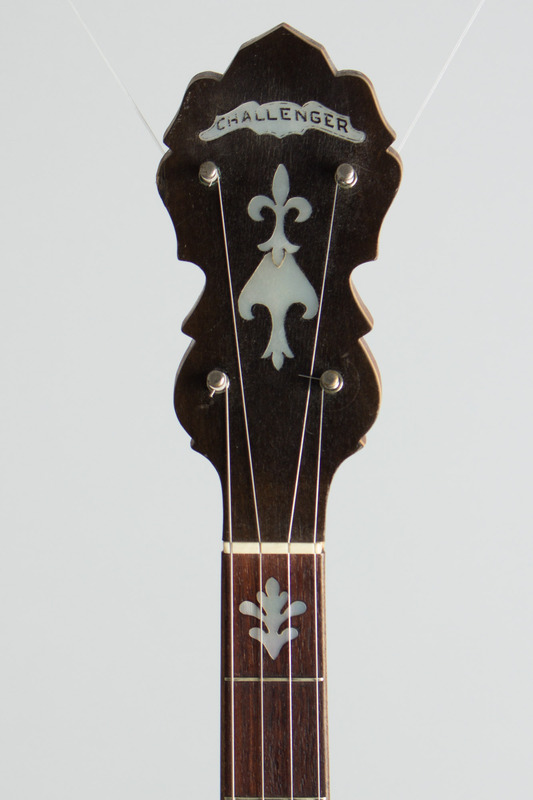 It works well in the original Plectrum tuning (C-G-B-D) or "Chicago' or guitar tuning (D-G-B-E), which is more convenient for the non-dedicated player. Still housed in its original hard case, which has been semi-tastefully edged in duct tape but is still functional. Excellent - Condition.